Location Advantage: Prime location in Noida. A) Highway Tower Noida are Located in sector 62 on main Fortis Hospital Road (60 meter). B) It is almost Zero km from NH-24, adjacent to Gennext School and Jaypee Engineering College. 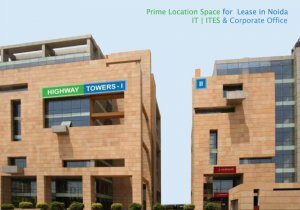 D) The site has proximity to commercial area to take care the need of the human capital& office requirements. E) Multi-national companies, Banks and Good Restaurants are nearby.